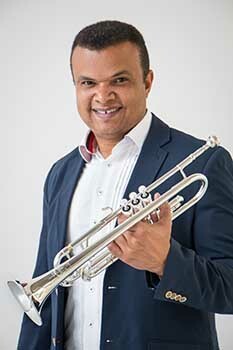 Born in Sao Paulo-Brazil, Amarildo Nascimento is the principal trumpet of OSUSP (Sao Paulo University Symphony Orchestra), professor of trumpet and chamber music at Cantareira College, Master Teacher for a school music program in Barra Mansa, Rio de Janeiro and B&S artist. Graduated in Music and Post Graduated in Music Education, Nascimento also has appeared as soloist, chamber musician and recitalist. As a soloist, has played in front of many orchestras like: Sao Paulo University Symphony Orchestra, Sao Paulo Academic Orchestra, Sao Paulo University Chamber Orchestra and others. As a Chamber musician, he is a member of São Paulo Brass Trio. As a recitalist, has appeared in many recitals with piano. Nascimento was a guest recitalist and soloist on the 7th and 8th International Trumpeter’s Meeting of Brazilian Trumpet Guild. Amarildo was a guest recitalist in the 42nd Annual Trumpet Conference, performing “Abril Desconhecido” by Celso Mojola, (dedicated to him), sponsored by the International Trumpet Guild. Appeared as the principal trumpet on Broadway’s musical “Beauty and the Beast”, performed in Sao Paulo-Brazil. Nascimento has been in many masterclasses of world class trumpeters like Philip Smith, Ole Edvard Antonsen, Mathias Höfs, Fred Mills, Rex Richardson, Friedman Immer, Martin Angerer, etc. and seminars like Music Seminar in Tuscany 2015, under guidance of Kristian Steenstrup and Reinhold Friedrich. As a teacher, Amarildo works hard in some music schools and keep a personal project of free video class on youtube.